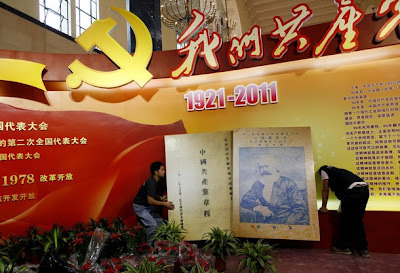 Workers hold a billboard of the "Constitution of Chinese Communist Party Book" and a picture of Karl Marx as they prepare an exhibition about the history of China's Communist Party at the Shanghai Exhibition Center, June 14, 2011. China's Communist Party will celebrate its 90th anniversary on July 1. (June 15, Chennai, Sri Lanka Guardian) The authorities of the Chinese Ministry of Public Security, who are responsible for internal intelligence, internal security and law and order, seem to be increasingly concerned over the tendencies of sections of the population to defy the measures taken by the authorities to enforce law and order. 2. Instances of such defiance have come since the beginning of this month from the Tibetan areas of the Sichuan Province and from Guangdong on the sea coast from where the Chinese economic miracle started in the early 1980s and then spread to other parts of China. 3. Buddhist monks in the Sichuan province continue to protest in public over the illegal detention of about 300 monks of the Kirti monastery in a military detention centre to subject them to what the Chinese call “legal education” following their demonstration of their solidarity with a 16-year-old monk who committed self-immolation in March to protest against the continued Chinese rule of the Tibetan areas. The protest has since spread to other Tibetan areas. 4. Tibetan monks and nuns in Kardze, also in the Sichuan province, have stepped up protests against Chinese rule despite being beaten up and detained in military camps by the authorities. 5.The Chinese authorities are going ahead with their plans for a major celebration in July in the Tibetan areas to mark the 90th anniversary of the founding of the Communist Party of China and the 60th anniversary of the occupation of the Tibetan areas by the People’s Liberation Army (PLA). 6. In view of the continuing protest movement of the monks, the Chinese authorities apprehend that attempts could be made to disrupt the special events planned to be held in July to mark the two anniversaries. They have, therefore, stopped issuing visas to foreign nationals for visiting Tibet till the end of July. However, there will be no restrictions on the visit of Chinese nationals to Tibet for domestic tourism. 7. The unrest in the Guangdong province has been over what is alleged as the unfair treatment meted out to migrant Chinese workers from other parts of China, who have been allowed to work in the manufacturing industries of the province. 8. Through strict control of the Internet, the Chinese authorities have sought to prevent details of the protest movement of the monks from reaching the outside world. However, they have not been able to prevent the details of the unrest of the migrant workers of the Guangdong Province from spreading to other parts of China and the outside world. 9. Protesting migrant workers are managing to send out messages through Chinese blogging sites, but the use of the blogging sites to spread messages of the protest has not been as extensive as during the Jasmine Revolution earlier this year in Tunisia and Egypt. 11. Xintang has been the epi-centre of the protest movement of the migrant workers. Security troops of the Ministry of Public Security, backed by armored vehicles, fired tear gas shells at thousands of rioters on the streets of Xintang township in the Zengcheng prefecture on June 23.Scenes of the firing of tear-gas shells have appeared on many blogging sites. Xintang is about 40 kilometers east of the provincial capital of Guangzhou.The protest movement began spontaneously on June 10. 12.In an incident reminiscent of what happened in Tunisia, the protest movement was triggered off by a dispute between security guards and a migrant couple, including a pregnant woman, who had set up a stall at the entrance of a supermarket. When the security guards tried to confiscate their earnings on the ground that they were running the stall without prior permission, a tussle ensued and the security guards allegedly pushed the pregnant woman who fell on the ground. The security guards arrested the couple, but other migrant workers prevented them from taking the couple to the Police Station. The riots started and it has been continuing off and on since then despite the arrival of security reinforcements. The migrant workers are demanding the arrest and prosecution of the security guards who pushed the pregnant woman to the ground.